Superstar Rajinikanth’s most awaited film “Kabali” has already smashed all the existing records of the movies and now it has made a new record. As for the latest reports, startup companies have declared a holiday on the release date of “Kabali” for their employees to watch the film in the first day. As for the sources, Chennai startup Fyndus and Bengaluru company Opus has declared Holiday for its employees not only declared a holiday but also booked tickets for its employees. 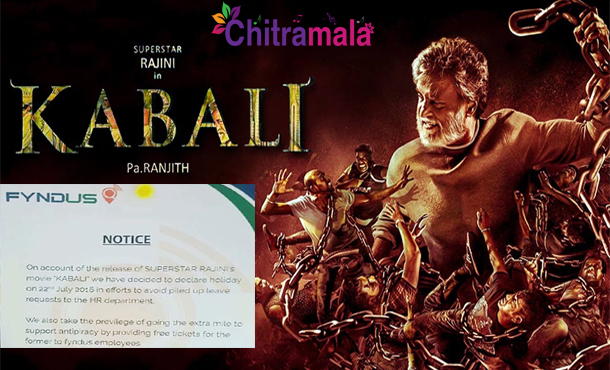 This is because, as the movie scheduled to release on Friday, 22nd July, Rajini’s fans have already started flooding their employers with leave applications to catch the first-day first show of “Kabali”. Let’s wait and see, how many more records Rajini’s “Kabali” is going to create ! !